LITNAV : Where Do You Want To Go Today? With inspiring short stories set in cities around the globe, the Litnav app puts international fiction at your fingertips. Litnav can find the perfect story to accompany your commute, according to journey-length, genre, location, and mode of transport. With stories by leading authors from five continents, there’s something to capture the imagination of even the most intrepid readers. Listen to a story while watching it unfold on the ‘map’ feature, or read with Litnav’s easy-on-the-eye eBook format. Each featured city has its own informative ‘key points of interest’ available along the way. Version 1.2.1 sees a whole new selection of fiction from a range of internationally renowned authors, and with new features including bookmarks, my downloads, social media sharing, and improved usability, Litnav offers an experience that’s personalised to you. Get Litnav FREE at the app store here! Litnav offers a new way of 'reading the city'. Choose a city - anywhere in the world - and be transported to it by its fiction. Traverse its precincts. Map your way through its quarters or arrondissements. The Litnav navigates as it narrates. With it you can travel by train, tram, metro, bus or indeed on foot, experiencing each new landscape through the eyes of a fictional character. Designed with the commuter in mind, the Litnav enables you to escape the tedium of your everyday 'known journey' and take an alternative route, a more scenic, imaginary one across the face of an unknown city. Choose a story according to the city you wish to visit, or the length of time you have to spare, and the listen function will lead you across an interactive map of that city accompanied by an audio reading. Downloading Litnav means you can see the city through the eyes of fictitious characters, take imaginary journeys through literature, or experience an alternative view of familiar streets. The response to the app so far has been amazing. We expected people to like the content, but we’ve been surprised by how much people love the discoverability of stories within the app, too. Short stories translate well: the situations they depict are often more universal than the novel, and yet they cling to their original language less tenaciously than the poem. This makes them perfect vehicles for imaginary journeys into unfamiliar locations and cultures. A genuinely progressive and exciting little app that just might point the way towards somewhere new that none of us would otherwise have thought to venture. The app is a mixture of all that Comma Press are founded on: short stories, translation, and a certain element of wanderlust. We've of course always been able to go anywhere with books, but how fantastic that authors, publishers and translators are challenging us to travel further than we otherwise might, transported by our phones and tablets, in scraps of precious time we might otherwise have found dreary. This app feels like it takes literature seriously as well as taking new technology seriously. It feels useful. It feels exciting. Yet again, Comma Press proves itself to be a serious pioneer of short fiction publishing. Devised by Comma Press and Literature Across Frontiers, and developed by Toru Interactive, Litnav brings together the fruits of the LAF's 'Tramlines' project and the best of Comma's 'Reading the City' commissions. 'Tramlines' was a residency project hosted by Literature Across Frontiers which took place in 2012 and 2013 across eight European and North African cities. Writers from Alexandria, Barcelona, Brussels, Istanbul, Manchester, Prague, Riga and Zagreb were paired up and visited the other's city with the task of exploring each cityscape through its tram network, in order to write stories that uncovered hidden corners and engaged with local communities and commuters. The residency authors were: Roman Simić (from Zagreb visiting Manchester), Michelle Green (from Manchester visiting Zagreb), Inga Zolude (from Riga visiting Brussels), Koen Peeters (from Brussels visiting Riga), Eman Abdelhamid (from Alexandria visiting Barcelona), Francesc Serés (from Barcelona visiting Alexandria), Jana Šrámková (from Prague visiting Istanbul), and Nermin Yıldırım (from Istanbul visiting Prague). 'Reading the City' is an on-going anthology series commissioned by Comma Press to explore ways for fictional narratives and urban landscapes to interact. The series has produced eight anthologies to date, including Madinah: City Stories from the Middle East, Shi Cheng: Short Stories from Urban China, and Decapolis: Tales from Ten Cities. The series has so far covered over 50 cities and translated dozens of writers into English for the first time. 'Reading the City' is part of Comma's wider commitment to the short story as a uniquely portable or mobile literary form, able to transcend boundaries, be they cultural, linguistic or disciplinary. Literature Across Frontiers (LAF), based in Aberystwyth, Wales, is a European platform for literary exchange, translation and policy debate. It works with organisations and individuals across Europe and beyond to develop intercultural dialogue through literature and translation. LAF runs a series of activities and projects that create opportunities for new literary connections and collaborations, and brings to light lesser-translated literatures. It also monitors translation activities and debating policy in the field of literature and translation. Comma Press is a National Portfolio Organisation and a not-for-profit publishing initiative dedicated to promoting new writing, with an emphasis on the short story. It is committed to a spirit of risk-taking and challenging publishing, free of the commercial pressures on mainstream houses. 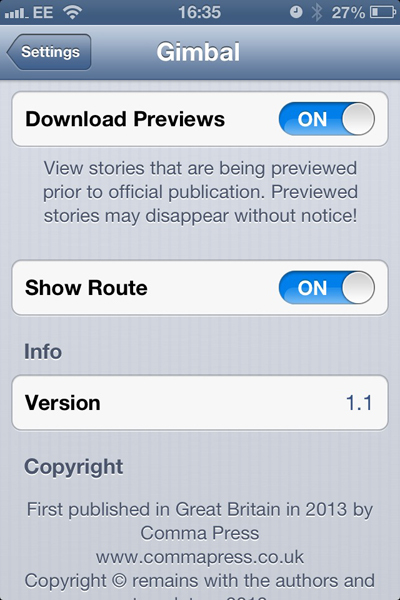 When you first install Litnav, you'll notice that only a small number of pre-loaded stories appear in the menus. To see what other stories are available, swipe down on the main 'Where Do You Want to Go Today?' menu screen. You'll see a small spinning wheel icon at the top of the page, while the data loads. If your journey will take you out of reach of a wifi network, it's a good idea to load up some stories in advance. Is Litnav available for Android? 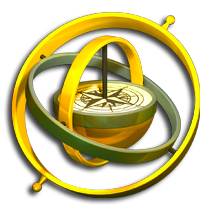 Litnav isn't currently available for Android, but we hope to roll out an Android version in future. Please sign up to the Comma Press mailing list to receive updates. What iPhone/iPad and OS do you need to run Litnav? Litnav is optimised for iPhone 5, and is also compatible with iPhone 3GS, iPhone 4, iPhone 4S, iPhone 5, iPod touch (3rd generation), iPod touch (4th generation), iPod touch (5th generation) and iPad. Litnav requires iOS 6.0 or later. When I first launch the Litnav app, I can only find four stories. How do I get more? The Litnav menu updates in the background while the app is running. You should find that more stories appear in the menu automatically. To force the menu to update immediately, please swipe down on the main 'Where Do You Want to Go Today?' menu screen. You'll see a small spinning wheel icon at the top of the page, while data loads. Is Litnav supposed to be like a guidebook, to help me find my way around foreign cities? No. Litnav was conceived primarily as a way for users to explore literary landscapes, by taking imaginary journeys in parallel to their own commute. Can I use Litnav on the Tube? Yes, so long as you pre-load a story before you go underground. We recommend that whenever you know your journey will take you out of reach of a wifi network, you pre-load a story (see below). Audio versions of stories are taking a while to load when I'm out and about. How can I get my stories faster?! The audio files of stories, and the maps, will usually load much faster on a wifi network than on 3G. We recommend that if you know you won't have access to wifi when you're on the move, you load some stories before you set off, via a wireless network. How do I delete the audio versions of stories I've finished listening to? Once the audio file of a story has been loaded, a small trash can icon appears to the right of the 'Listen' button for that story. Simply click on the icon at any time to delete the audio. If you delete the app entirely, all Litnav data (including audio files) will be removed from your phone. How are stories selected for the Litnav app? Litnav is produced in partnership between Toru Interactive (App Developers), Comma Press (Short Story Publishers) and Literature Across Frontiers (Promotional Organisation for Literature In Translation). Some of the stories featured on Litnav were written during the 'Tramlines' project - a writers' exchange programme coordinated by LAF - while others were written as part of Comma Press' 'Reading the City' series of short story books. More at www.commapress.co.uk. Design work: Sean Toru, & Oban Jones.